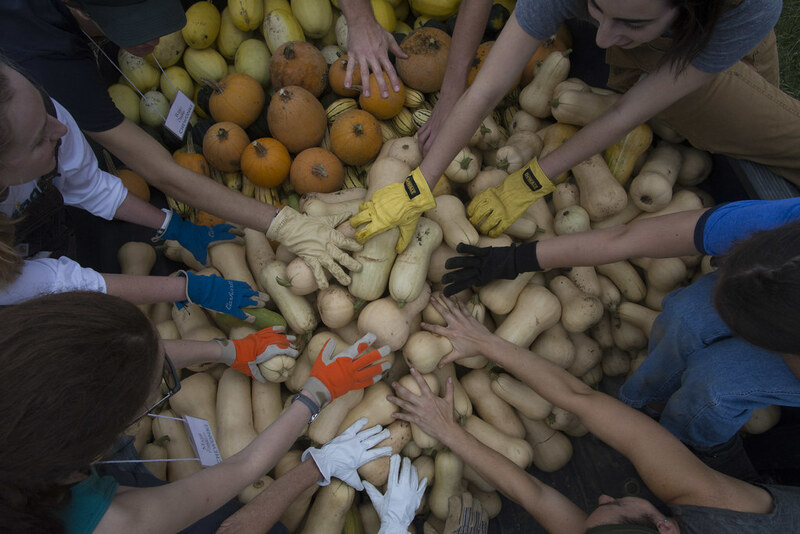 Last week, the 46 new Maine Coast Semester students harvested thick-skinned squash at Chewonki’s Salt Marsh Farm. Summer days and thin-skinned squash (think zucchini) are over, but butternuts and acorns have their own dusky allure, suggesting things to come: frosty mornings and hearty meals on chilly nights. The students brought in about 75 pounds of delicata squash, 100 pounds of acorn squash, 150 pounds of pie pumpkins, and 600 pounds of butternut. They now lie like pirates’ loot on racks in the Udder Way Out, a dry storage space on the back side of the Wallace Center. They will cure for various lengths of time, depending on variety. As they cure, moisture will evaporate through those thick skins, concentrating sugars to make the golden flesh more delicious. The cooks will then roast, bake, broil, and boil it to brighten our table as fall tumbles into winter–a physical connection to the warm sunshine that blessed the farm all summer. “We’ve had a good winter squash year,” Assistant Farm Manager Hilary Crowell says with a satisfied smile. “With the help of our early-summer farm workers, we did a really good job with row covers.” Covers let the sun and rain in but kept out the striped cucumber beetles (who like squash plants as much as their namesake).